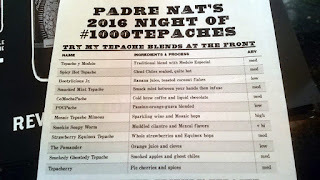 On July 23, 2016, I attended Reverend Nat's Night of 1000 Tepaches event in Portland. 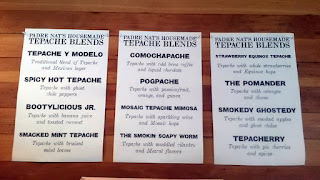 While there weren't literally 1000 varieties, I sampled a bunch of tepache blends for panda science. 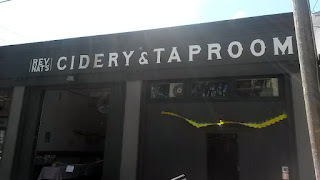 The event started at 4 PM but I got there before 3, figuring I could have some cider and then kill some time. There are usually a dozen taps, each featuring a different Reverend Nat's cider. 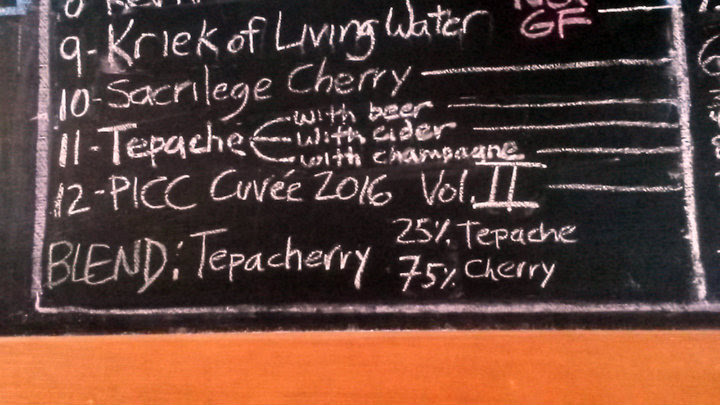 I went with the advertised special Tepacherry blend ($6), which is 25% Tepache and 75% Sacrilege Cherry cider. 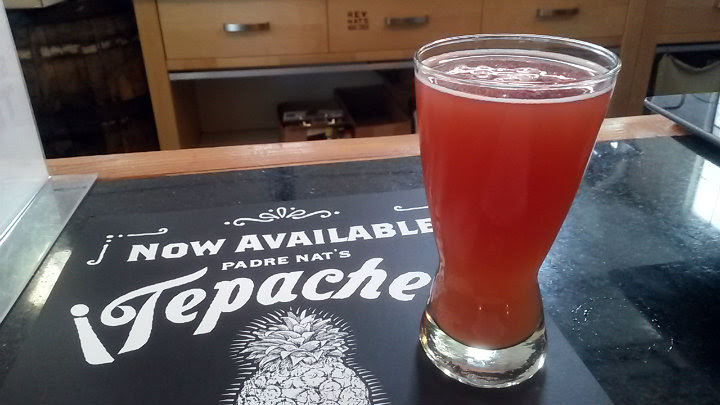 Beautiful color, with the right amount of citrus and tart. 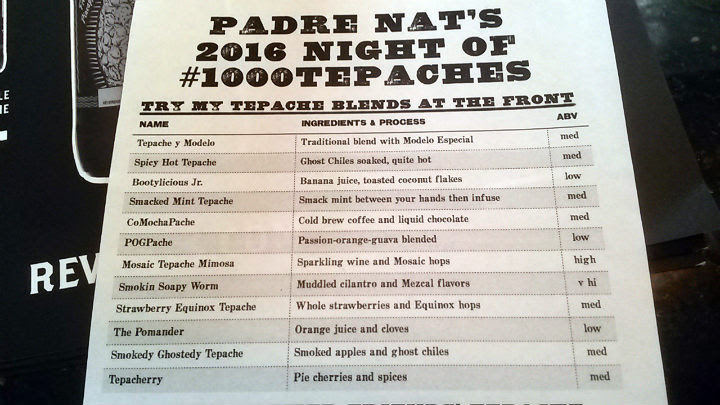 Of course, I found out that Tepacherry would be one of the featured blends for the Night of 1000 Tepaches. 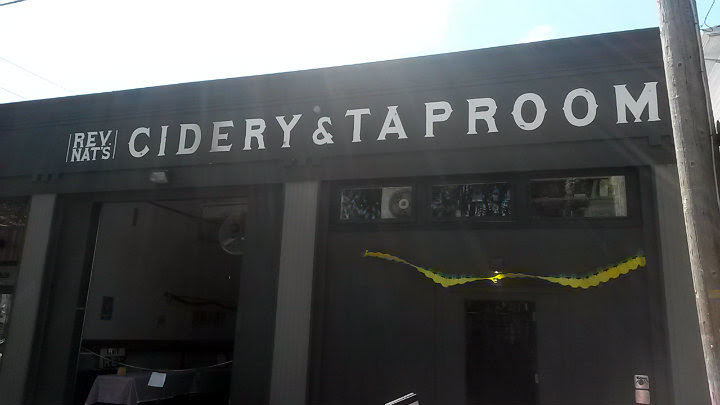 From 3 to 4 PM, the crew switched out all the kegs to prepare for the event. Officially, there were 21 different tepache blends on this night: 12 in the front and another 9 in the back. 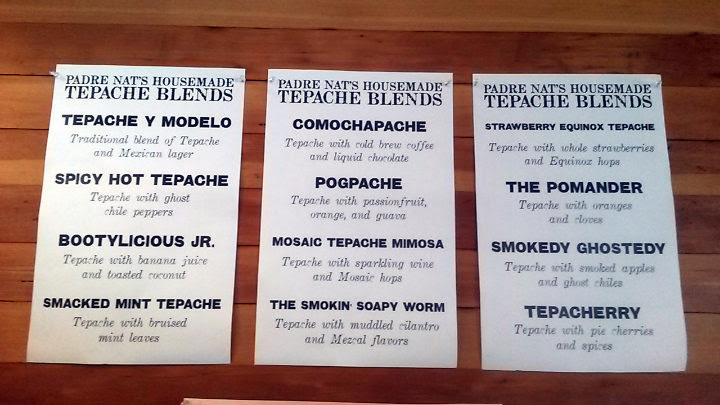 Once 4 PM hit, I went to town on trying all the tepaches in the front of the house. 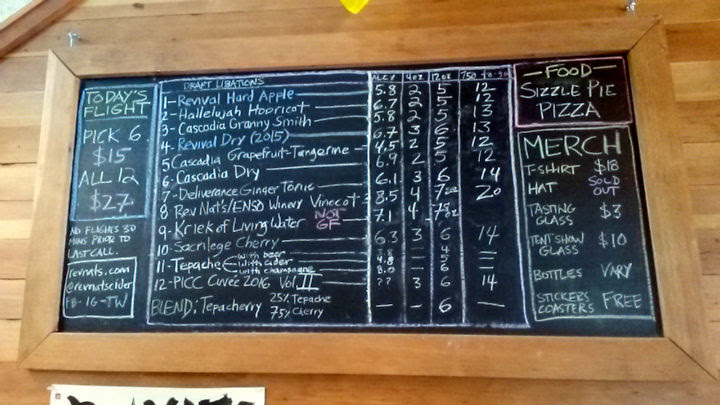 You could get a 4 oz pour for one token. Each token cost $2. 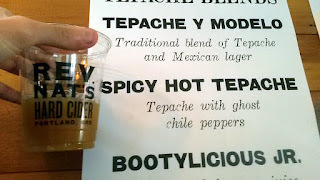 SPICY HOT TEPACHE: Everyone knew I was getting the spicy options first. 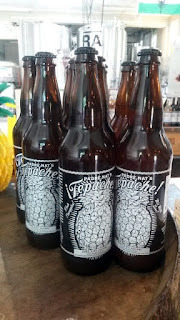 This was straight-up tepache with ghost chiles. All the employees said it was hotter than the one I tried two years ago. 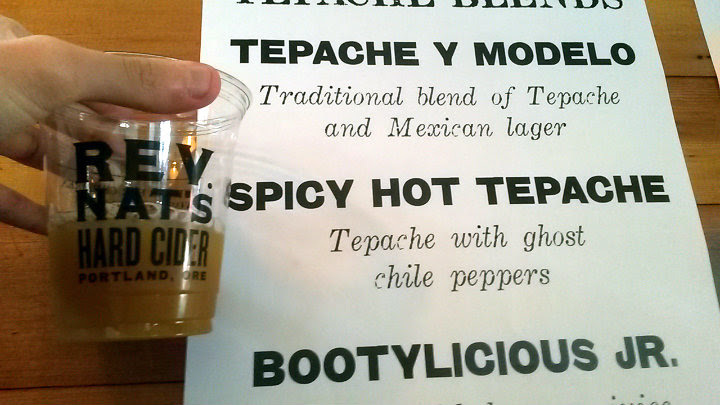 It was, but at least for my broken palate, just slightly spicier. Others were enjoying it throughout the night, so it wasn't anything nuclear. SMOKEDY GHOSTEDY: Tepache with smoked apples and ghost chiles. 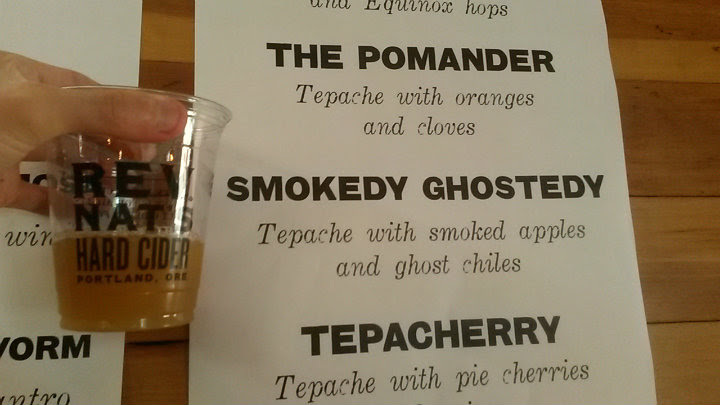 Pretty much a smokier, less sweet edition of the spicy hot. Very well done. 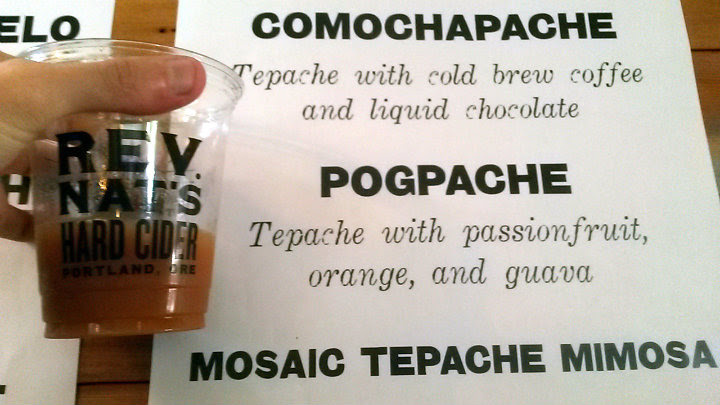 POGPACHE: The Hawaii staple POG (passion-orange-guava juice) with tepache. Without question my favorite blend of the night alongside the Pogpache / Spicy Hot blend noted below. 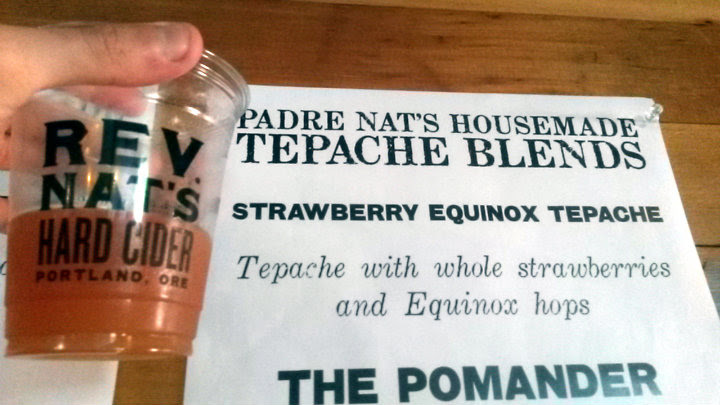 This is something you would drink on the beach while lying in a hammock. I then took a short break for food. 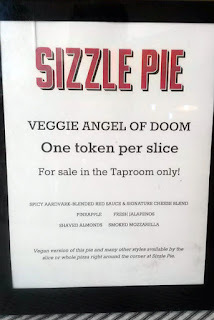 Sizzle Pie even brought a special pizza for the event. The Veggie Angel of Doom featured a spicy aardvark-blended red sauce and signature cheese blend, pineapple, fresh jalapenos, shaved almonds, and smoked mozzarella. 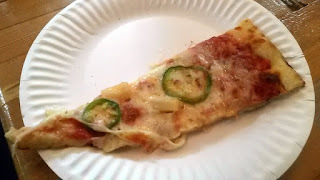 A fairly thin slice, but very good. 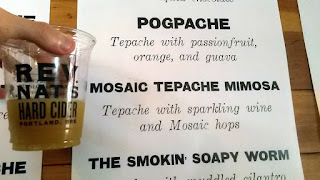 MOSAIC TEPACHE MIMOSA: Tepache with sparkling wine and Mosaic hops. Another delicious blend. 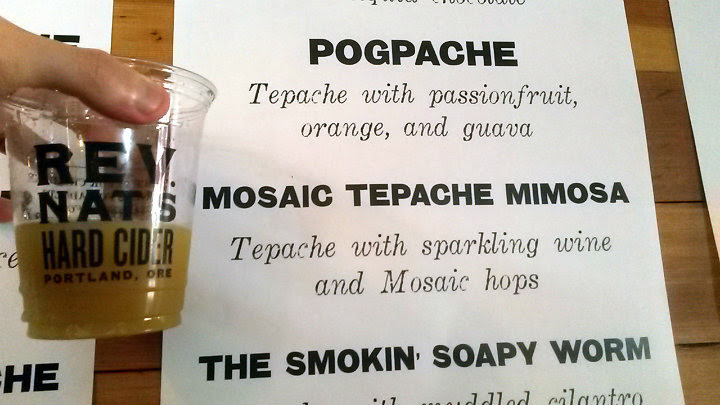 The Mosaic hops brought out that extra citrus that made it a major hit with me. 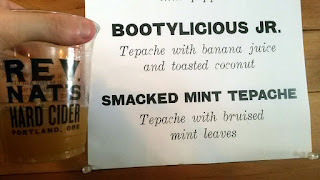 SMACKED MINT TEPACHE: Tepache with bruised mint leaves. 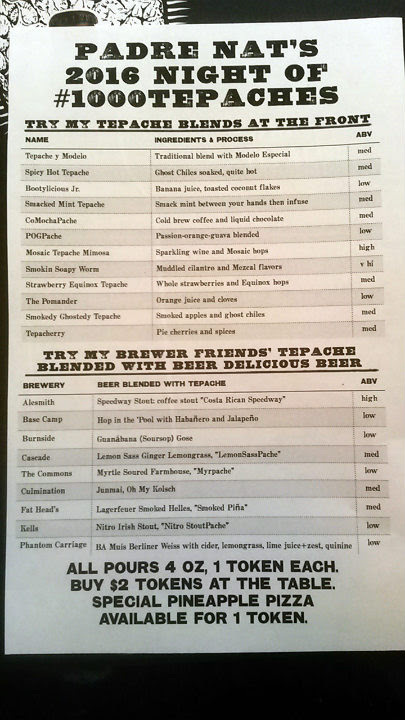 A couple employees mentioned this as their favorite, and they were spot on here. Pineapple and mint make a classic combination. 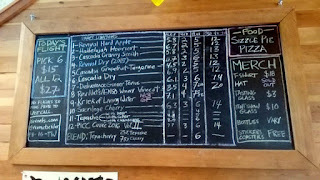 If you see this on the board in some manner again, you need to try it. 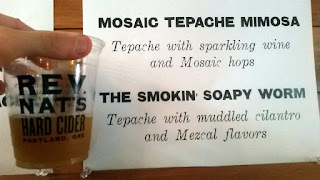 THE SMOKIN' SOAPY WORM: Tepache with muddled cilantro and Mezcal flavors. Admittedly, a choice that may not be a hit with everyone. You probably will want to enjoy cilantro and especially tequila flavors for this (as Mezcal is the agave cousin of tequila). 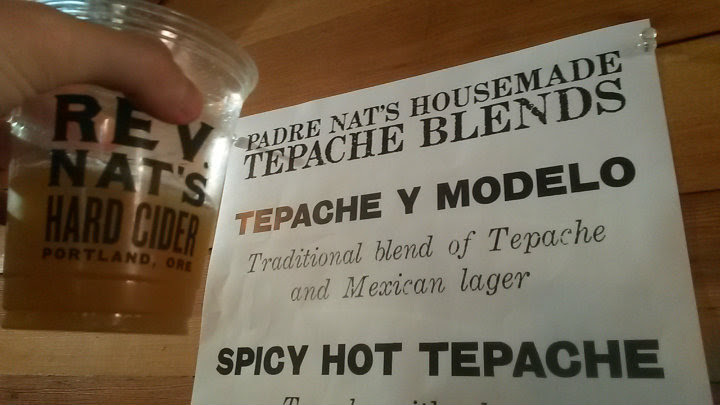 Fortunately for Reverend Nat's, I enjoy tequila every now and then. 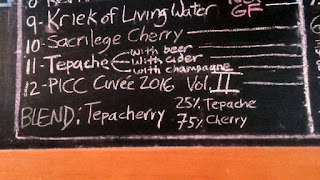 It's a potent beast at 17% ABV. 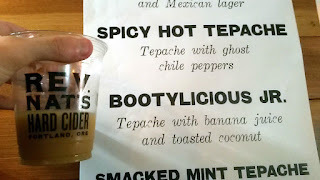 BOOTYLICIOUS JR.: Tepache with banana juice and toasted coconut. Came across as an adult banana smoothie. The coconut took a backseat here; the pineapple and banana were the dominant flavors. It's a hit if you want something sweet. 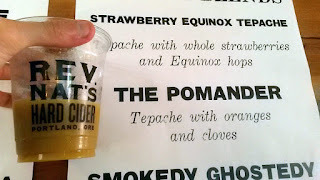 THE POMANDER: Tepache with oranges and cloves. 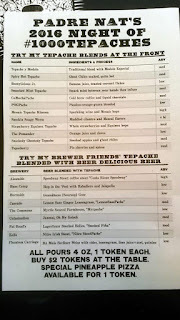 The flavors reminded me of an adult Orange Julius. To me, the right amount of clove that complemented the orange and the tepache. Probably my second non-spicy favorite after Pogpache. 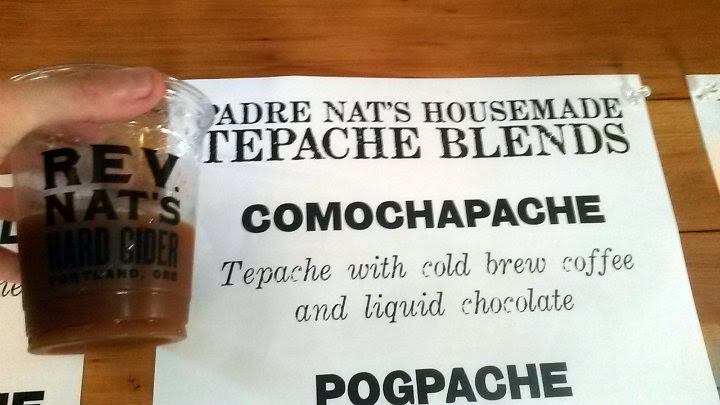 COMOCHAPACHE: Tepache with cold brew coffee and liquid chocolate. 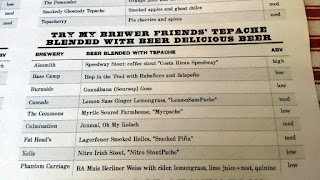 This one was one of the most intriguing blends, as I never thought about combining pineapple flavors with coffee and chocolate. Still, it worked very well. 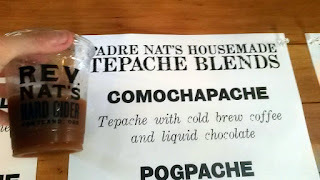 I would challenge Todd at Ole Latte Coffee to make a version with his cold brew and Reverend Nat's Tepache. 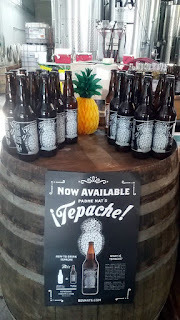 TEPACHE Y MODELO: Traditional blend of Tepache and Mexican lager. A very smooth and refreshing beverage. 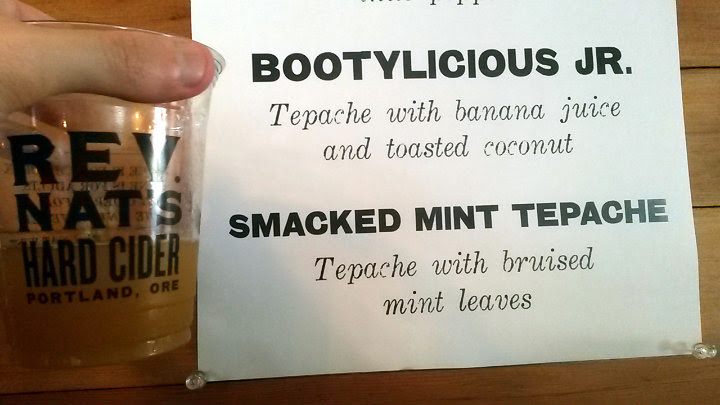 I can certainly see myself lying by the beach with this beverage in hand. 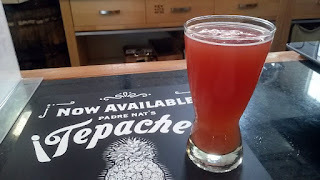 STRAWBERRY EQUINOX TEPACHE: Tepache with whole strawberries and Equinox hops. Another blend that made me think smoothie. 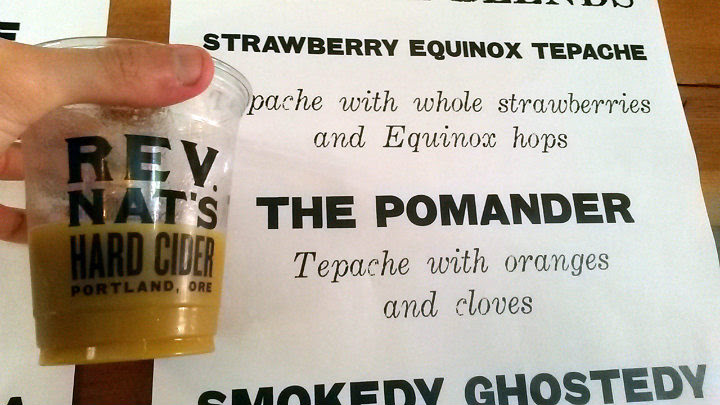 Awesome citrus flavors and very refreshing without being overly sweet. Another personal favorite. As a bonus, I decided to mix the Spicy Hot Tepache with the Pogpache. 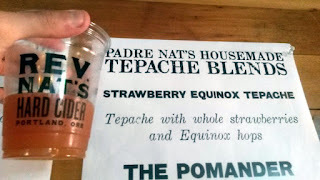 If only Reverend Nat's would bottle such a genius creation, I'd be all over it. 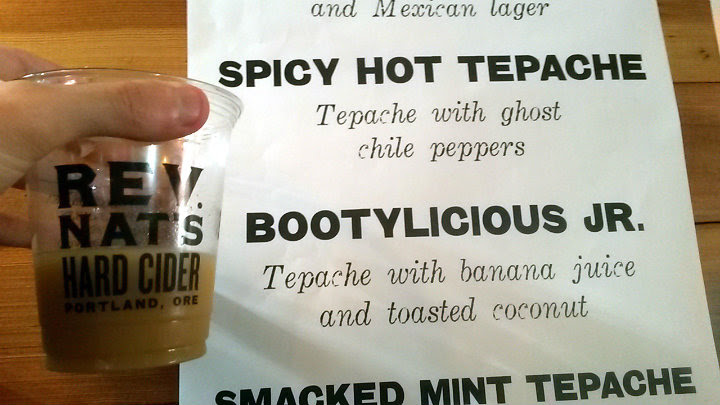 It basically became a spicy tropical alcoholic beverage. 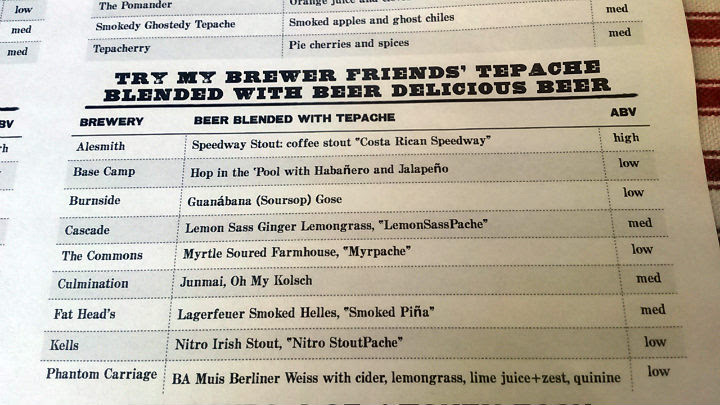 Would drink a growler of that, probably in one sitting (or struggle all the way to the end for it). Over the 7+ hours I was there, a ton of people showed up for the event. 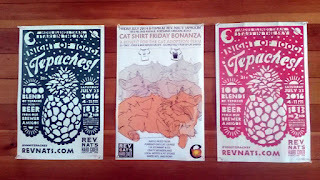 I look forward to next year's festivities!